Tax planning is invaluable, especially when it comes to reaching your financial goals. Working with an expert who understands tax rates, credits, and deductions (in addition to general tax laws) can help individuals and businesses manage funds wisely. With the thousands of new pages added to the tax code each year, you need a qualified advocate who understands your exact situation. Baker Retirement & Wealth Management, PC offers tax planning services in Evansville, Indiana. We’ve been doing so for over three decades. This blog post outlines a few ways that tax planning helps both companies and individual taxpayers. Your financial decisions become increasingly important as you get closer to retirement. After building your nest egg, you’ll want to consider your strategy for managing income distributions from retirement and investment accounts – without placing an unnecessary tax burden on yourself. Tax planning can help you make the most financially savvy decisions for your unique circumstances. After all, you want to enjoy your retirement, not spend your golden years worrying! Many people make the mistake of thinking only about the growth potential of their nest egg. However, spending time thinking about the tax aspects are equally important. Are You Eligible for Tax Deductions or Credits? Changes to your finances can turn tax preparation into a major process. It’s important to think about all of the items that could potentially be deducted (within the law) from your taxes in order to save you money. Contributions to accounts such as IRAs and Indiana College Choice 529 Savings Plans could be eligible for tax deductions or credits. Every day living expenses such as housing costs, childcare costs, and more could also provide possible deductions depending on your situation. That’s why it’s helpful to work with a tax planning expert to create a plan for your finances. Understanding your potential deductions and credits allows you to spend and invest your money wisely throughout the year. We’ve developed this checklist to start the conversation with you. It should help you consider some of the many deductible items on your taxes. We hope that you find it useful. In particular, businesses can benefit from tax planning services in a number of ways. Tax planning helps your management team understand how business decisions affect tax liabilities. Tax planning provides clarity for your financial goals and helps you to create strategies for maximizing profit distributions. If you are considering selling a business or searching for financing, tax planning can prevent you from making costly errors in the process. 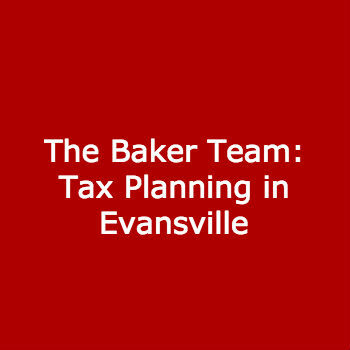 The Baker team has been providing tax planning services in the greater Evansville, Indiana area for nearly thirty years. Our expert tax planning team can assist you with decisions related to your individual or business finances. Call us toll-free today or submit a form on our website to schedule a risk-free consultation at our office in Newburgh. How Will Your 2014 Health Care Coverage Impact Your Taxes? Affordable Care Act: Are You Required to Purchase Coverage?